The new war drama 12 Strong begins with a news clip about the 1993 bombing of the World Trade Center. It then flashes to clips about the 1998 bombing of U.S. embassies in Tanzania and Kenya. 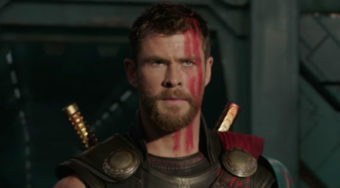 The feature then flashes to a house where young father Mitch Nelson (Chris Hemsworth) is introduced at home with his wife and child. Nelson is a veteran who has finally returned home to the desk job he requested. Like so many others, Nelson recommits that day to facing down the enemy that made such an attack possible. Under the command of Max Bowers (played by real-life veteran Rob Riggle), Nelson leads his team into Afghanistan in the days following the attacks. His task is a complicated one. His mission is to ally himself with General Dostum (Navid Negahban), a quietly intense warlord who had been fighting in his country for years. When Nelson and his team first meet Dostum, they don’t know if the general plans to work alongside them or sell them to the Taliban. There’s a murkiness to his intentions that is present throughout the film. A murkiness that reflects the general’s changing alliances. In an early mission with Nelson, the general tells the Americans to target a specific Taliban camp with aerial bombs. The soldiers don’t know if he’s telling the truth or simply using their advanced weaponry to take out one of Dostum’s political rivals. The soldiers were driven to Afghanistan because of their patriotism but they are overwhelmed by the complexities of that country. 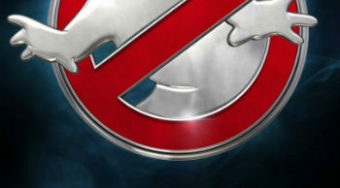 That’s one of the elements that the screenplay by Ted Tally and Peter Craig often focuses on. There’s a chaos in war and plans consistently change in the field. In some wars, the enemy is easier to identify. In Afghanistan, that doesn’t apply. One-time allies can become your enemies and your greatest opponent can become a friend. With a running time of two hours and ten minutes, 12 Strong does feel a bit long. 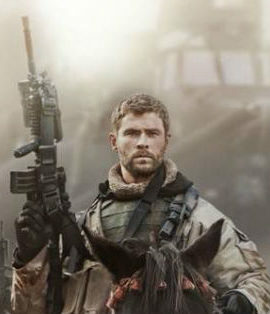 However, the film’s overall story about Nelson’s team of twelve soldiers riding on horseback into an alliance with Dostum is a strong one. Because the specifics of this mission were classified, the brave soldiers never received the acclaim they should’ve received for their surgical precision in taking on such a mission. This film does them justice by showing the sacrifices they had to make in order to serve (several early sequences show the soldiers saying goodbye to their loved ones) and the work they did in retaking several cities from the Taliban. 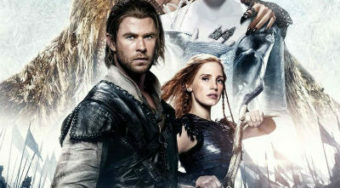 Chris Hemsworth does an admirable job in the lead role (although it’s hard not to notice his native accent creeping in every once in a while) but the supporting cast stands out, especially Negahban. The actor’s weariness comes through as he voices the pain of a man who has spent much of his life in battle and knows that it might never end. 12 Strong applauds its heroes but also reveals some of the complications of waging war in Afghanistan and that’s what makes it stand out. 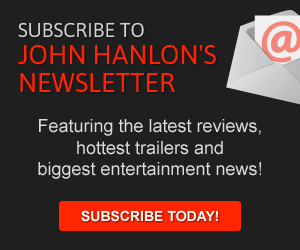 John Hanlon is our film and television critic. He can be followed on Twitter @johnhanlon.